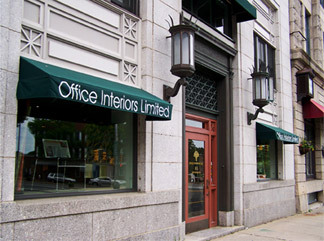 Our showroom has been located in beautiful downtown Dover, NH since 1986. We restored the old Strafford Bank building, which was originally built in 1926. Spanning two floors, our 9,000 square foot space showcases a wide range of products including workstations, private office furniture, conference and training furniture, seating, moveable walls, raised flooring, lighting and more. The space was designed as an idea starter for our clients who want to visualize the many different options available in contract office furnishings.